Awards are sweet, but is there a better recommendation for an interesting non fiction than knowing other kids have enjoyed it? I think not. So here is short list of books I have read to and with kids recently. Please add your favorites in the comments section so we can have a solid list for the holiday season. I’m not going to link to encourage any possible shopping in our local bookstores before they are gone for good. These are all biographies mostly( but not entirely) related to American History. All well deserved winners with the grade 3-6 crowd. All over the internet, I have heard about public and school libraries investing in STEM books. One librarian said that she "ordered thousands of STEM books (fiction and nonfiction)". Where can a list of STEM nonfiction books be found? Just look over to the right ☛. Also, check out STEM Friday started by Anastasia Suen. On the STEM Friday website check out the host each week for a list of great STEM books. The new word in town is STEAM. Due to the outcry of the lack of Art and Creativity in the STEM acronym, the education community has been building STEAM. 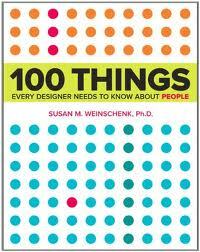 Let's hear it for those interesting Art and Design nonfiction books for kids. because we all know that the ideas of our children are the future. A few years ago I was greeted at a school by more than the usual “Welcome” banner. A bulletin board shouted, “Mr. 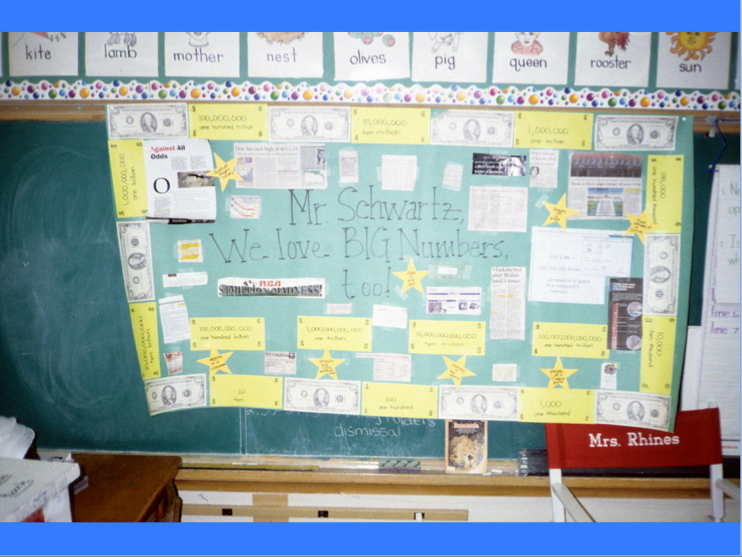 Schwartz, We love BIG numbers, too!” Some of the numbers in articles from newspapers, magazines and websites had been highlighted, and children had written about the significance of the numbers in the context of the news items. I appreciate it when a teacher guides students to the confluence of math and social studies where numbers and current events meet — which they do every day. Numbers are always in the news. I recently explored some of the many youtube videos and web pages devoted to “explaining” big numbers, especially when they have $ signs in front of them, and I found that most have a covert (or overt) right wing anti-tax message. Someone should catalog the comparatively few whose political undercurrents run the opposite way (illustrating $s for the military budget in comparison with, say, education or hunger programs). This could be the subject of a future post, but right now I am going to examine three newsworthy numbers that have invited my musings. If your household were right at the cutoff for the 99th percentile in income, your family’s annual income would be $506,533. You and your fellow Americans of equal or greater income in the top 1% would, in fact, be earning 20%, or one-fifth, of all American income. But what you earn alone is not what determines your wealth. Your wealth is what you’ve accumulated. The top 1% holds about one-third of America’s riches — an average of just over $19 million. Nice going! Tough luck for the rest of us. 7,000,000,000 (aka 7 Billion) I’m looking at a scan I made of a newspaper article from October about the earth’s population reaching a milestone population — a billion multiple. But it’s not seven billion. It’s just six billion. 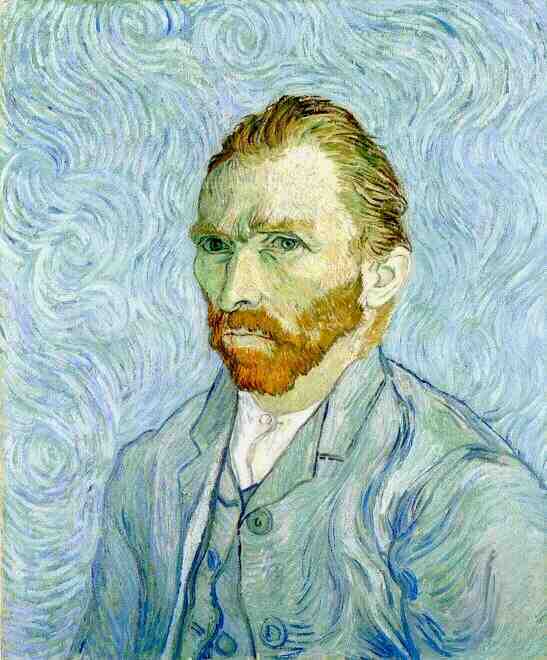 I scanned it in October, 1999. At that time, the 6 billionth human was getting ready to be born. Last month — October, 2011 — the media were again abuzz about the earth’s population reaching a billion multiple: 7 billion. That means our planet added one billion people in a mere dozen years. Demographers have been stunned. But our growth rate is slowing. By 2050, we’re predicted to add only another 2.3 billion — an amount that nearly matches the number of people who inhabited the planet in 1950. Explainers from Ann Landers to President Reagan to David Schwartz have tried to put big numbers into micro-narratives for public consumption. “If you wanted to count from one to one billion,” I wrote in my first book, How Much Is a Million?, “it would take you about 95 years.” Hence, it would take almost 700 years to count every person on earth today. Of course you’d never be able to keep up with the population as it grows. — In 1975 there were three cities with populations over 10 million; now there are 21. The app also says it would take you 200 years to count to 7 billion. I disagree. That would be possible only if you averaged about one number per second. Try saying a few of the big ones and you’ll see it’s impossible to whiz through them that fast. 17.2 million You may have missed this stat, which I share in the wake of Thanksgiving weekend. It’s the number of households in the US who are “food insecure,” the euphemism du jour for “hungry.” Representing 14.5% of households (one in seven), it’s the lowest level of food security in our nation’s history and it encompasses 48.8 million people. The following figures are reported by Pat Garofalo, Economic Policy Editor for ThinkProgress.org. Food insecurity has grown by 30% during the Great Recession. Almost 4 million of food insecure households have children. Fifty-five percent of the households participate in one or more of the three largest Federal food and nutrition programs — SNAP (formerly Food Stamps), WIC and the School Lunch Program — yet 10.5 million eligible children do not participate. Last year, nearly half of the households seeking emergency food assistance reported that they had to choose between paying for heating fuel or food. These are not cheerful statistics to contemplate as we conclude the Thanksgiving weekend, but ignoring them would be about as appropriate as further tax cuts for billionaires. This month I’m lending my INK blogspot to Meribeth Schenk, author and librarian. We hear a lot these days about how books, reading, and learning are lighting out for the Territory – new and yet-to-be-discovered Territory. Here’s how one school is doing it. I am a Mac lover, as are elementary students at Miami Country Day School in Miami Shores, Florida where I’m one of the Media Specialists. A recent installation of twenty-two beautiful new Mac computers transformed the Lower School Library by merging it with Technology programming, and streamlining the book collection into a renamed Media Center. During the previous school year and continuing into this year we’ve acquainted students with not only the expected OSX and Windows platforms and Microsoft Office Suite (PowerPoint, Word, Excel), but also with several other wonderful programs like Pixie and Frames (Tech4Learning.com), Paint, and the iLife Suite (iMovie, iPhoto), offering inventive opportunities for students to create their own work. Also, students and faculty are becoming accustomed to specialized databases and subscription based websites such as, Accelerated Reader (AR), Learning.com, World Book online, IXL.com, etc. Presenting both traditional and non-traditional storytimes, we share websites like ericcarle.com with kindergarten and first grade classes where the video of the author/illustrator himself reading The Very Hungry Caterpillar mesmerizes students. Then, we offer these same students a chance to increase their mouse skills by designing their own multi-colored caterpillars, using the tools on Pixie, a subscription-software designed to promote creativity, organization of ideas, and story webs. We invite second and third graders to choose (from books written and/or compiled by Douglas Florian, Karma Wilson, Jack Prelutsky, Kristine O’Connell George, Lee Bennett Hopkins, Karla Kuskin, Shel Silverstein, to name a few in the Media Center’s collection), practice (at home in front of a mirror) and read (or memorize) a poem to share in front of their classmates. Students are filmed, for later use of combined videos, to create a poetry slam presentation during April -- poetry month -- when students also share poems they have written. 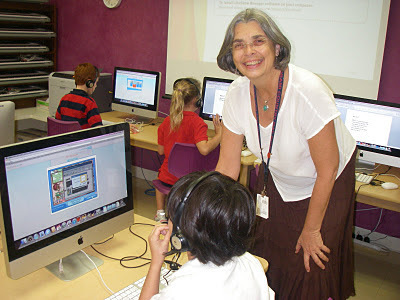 Third, fourth and fifth grade students become familiar with labyrinths by way of stories, and search engines. A labyrinth is a spiral path, leading into the center and back out. Often effective as a meditation tool, a labyrinth can be used for balancing mind, body and spirit. Searching for labyrinths in a country of their choice, students also use globes, atlases, and webquest to discover labyrinth locations around the world. By tracing mazes and labyrinths, students begin to discover differences (mazes have dead-ends and blind alleys to confuse, labyrinths are single paths allowing one to be reflective). Then, drawing labyrinths using seed patterns, and creating their own labyrinths using the computer program, Paint, extends the experiences in preparation for walking a canvas labyrinth as a culminating event. When students share their impressions through drawings, writings and comments after the labyrinth walk, the insights are often moving, profound, and surprising. Additionally, fifth grade students use a storyboard template to guide their planning as they prepare to share their favorite book using Frames. This simple program works like a flipbook, as students create an animated movie, generating illustrations, and adding sound and music to enhance their book trailer. • student/ grandparent pairs sharing in an interview -- WIWAB/WIWAG (When I Was A Boy/Girl) -- using questions the students had prepared in advance, talking together on PhotoBooth, discovering each other in new ways, and honoring the legacy of shared experiences. These few sample activities give a flavor of a new curriculum as it develops: an integration of trade non-fiction and fiction with texts and classroom lessons, supplementing with cameras, internet, and computer programs, helping to expand educational opportunities for our students. • expansion of assignments using both books and computers to maximize learning potential. Final products are often available on a loop, displayed on screen in the Media Center during parent open house and conference sessions, and at years end. Students regularly bring their families to “show off” the Media Center. They want their families to view what they’re imagining and producing -- a satisfying moment for all participants. Nonfiction is about honoring and reflecting the truth in the world. It asks us to look with fresh eyes at what is around us, at the underpinnings of our lives whether that be in geology, geography, or history. Nonfiction is important and far reaching. Usually, I remember that. But not first thing this morning. This morning I read an email by a fiction writer friend about an extraordinary fan letter she had received. Moved and amazed by the letter, I thought to myself: I bet those kinds of letters are elicited more often by fiction. Then I experienced the “twinge.” Yes, it was that mosquito-like, momentary, should-I-write-a-novel-instead pinch that plagues nonfiction writers. This in my mind, I drove to the farmer’s market. A young woman at one of the farm stands stopped me. 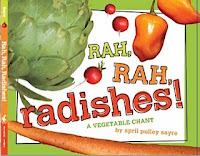 She had told me, months ago, how much she loved Rah, Rah, Radishes: a Vegetable Chant, and how special it was to her because she picks some of the vegetables that come to market. Today she told me that her father, after heart attack and stroke, was in the hospital. He had a hard time remembering. But he enjoyed looking through Rah, Rah, Radishes, again and again. I asked if he was a farmer. No, she said, he just likes looking through the book. He doesn’t remember many things. But every time someone comes in the room, he shows them the book photos and he proudly tells them: This is what my daughter does. I thanked her, teary-eyed, daughter-to-daughter, for sharing her story. Once again, nonfiction surprises. It seems like a good time, near Thanksgiving, to think about how words, photos, art can shine a light on unheralded essentials in our lives. A pilgrim, passed I to and fro." Pilgrims of Plymouth, by that brilliant Susan E. Goodman. The National Geographic also published the handsome Mayflower 1620: A New Look at a Pilgrim Voyage (Peter Arenstam) and 1621: A New Look at Thanksgiving (Catherine O'Neill Grace). And a blockhead I would be if I didn't mention The Adventurous Life of Myles Standish and the Amazing-But-True Survival Story of Plymouth Colony, 144 pp., "painstakingly written and illustrated" by me, in part in order to tell the Pilgrims' back story and what happened after that so-called First Thanksgiving. Hot gravy and carrots and corn and green beans. Glass dishes of celery and pickles and beets. And if there’s still room, we will have pumpkin pie. For whipped cream & hot coffee & cold pumpkin pie. An Invitation to Comment: Gathering Nonfiction E-Book Data/Opinions from YOU! Saving OP books, giving new life to in-print but barely moving books, or adding a layered, multi-dimensional platform to a healthy title—these are just three of the common reasons publishers, editors, and authors are discussing the world of electronic books as it applies to nonfiction. Most of us have e-book clauses in our contracts, but as the e-world is rapidly changing, so our rights, which has authors and publishers clamoring to figure out the best ways to proceed. At least for right now, there doesn’t seem to be a clear answer and it can be very book-specific when it comes to nonfiction. In contrast, I have plenty of fiction writer friends who are successfully getting their e-book rights back (generally from OP or almost-OP books) and publishing in this format on their own—for 100% of the profits, minus expenses. But when photo rights and book designs factor so heavily into the final product of a nonfiction book, things are much trickier. If the e-rights for photos have not already been secured for an older NF book, it is not necessarily feasible from a time or money standpoint to track them down again. I certainly make sure I have e-rights for photos now, but that wasn’t the case a few years back. Read this recent INK post from Jim Murphy for his perspective on one aspect of this issue. And Marc Aronson has tackled this topic in his SLJ blog, Nonfiction Matters, here and here. 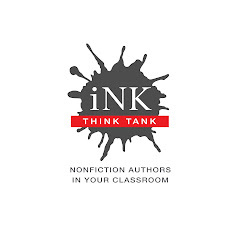 I think it would be worthwhile as well as illuminating to have NF writers and publishers, as well as readers, teachers, and librarians share some of their thoughts and insights, to see what some of the varied experiences are. I am also quite interested in hearing from people about what they think the future will hold. Greetings, I.N.K. readers! Please help me with a little experiment…do you prefer version 1 or 2? We often use words, words, words, (and only words) to express what’s on our mind (or should that be minds?) 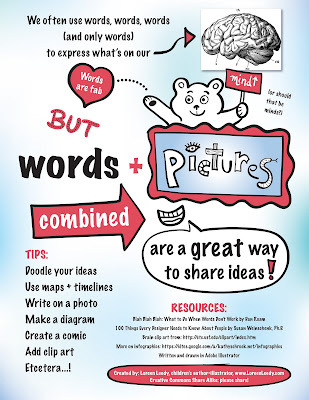 Words are fab BUT words plus pictures combined are a great way to share ideas! Brain clip art is from Clipart ETC, courtesy of FCIT at the University of South Florida. 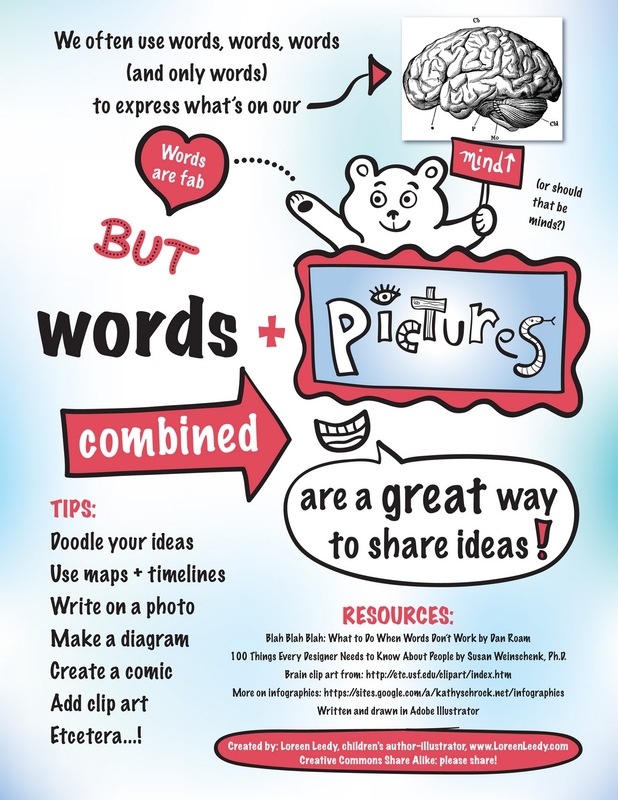 More on infographics from Kathy Schrock’s site. So…? If you’re anything like me, Version 2 is much more fun but more importantly is more memorable. Not everyone will agree (which is fine, too). 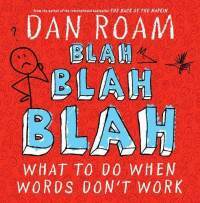 One of the insights of the Blah Blah/100 Things books is that humans evolved over millions of years to take in information visually to a large degree, and we limit ourselves unnecessarily if we communicate with words alone. If we bury people in too many words, we may confuse and/or bore them. Many other research-based conclusions about how people perceive, learn, and recall information are mentioned in these books. I’ve been wanting to make an infographic for a long time; please feel free to repost it, print it out, or otherwise share it (without changing it please.) Enjoy! If it were up to me, you'd listen to this song while reading this post. But sometimes, it seems, you go out with someone for a very long time before you realize he or she was not your bashert. This has just happened to me. It was a long relationship, but it was going nowhere. It just took me a very long time to realize that because I thought... I was sure...though I had niggling doubts...that I was in love. But breaking up really IS hard to do. I mean, look at her. 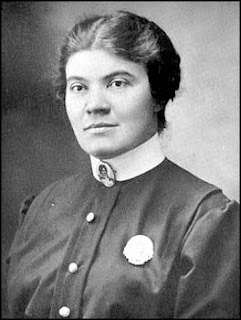 An early NYC policewoman. A detective. And we had spent so many, many months together. The more time, energy, money, time, time, time, you invest in a topic, the more reluctant you are to let it go. I bought and read very many books. I spent many hours looking for people who knew the person I had fallen in love with. After much detective work, I found her descendants. That was a great day! And then her great granddaughter became an enthusiastic helper, inviting me to come to her house, where I combed through boxes of clippings, notes, photos, memorabilia, and even recordings, hoping for the big break in the case. I dug deep into the web, into online newspapers, books, footnotes of journal articles. I reached out to authors, researchers, professors, librarians... But I just couldn't get enough primary source information. There was no great case, no story arc, and much of the information was that kind of early 20th century, questionable, surfacey--maybe even fictionalized--storytelling that made this researcher queasy. I could write a great novel about her, sure. And I always wanted to try writing historical fiction, but I was determined to write about her as nonfiction. She was such a character, such an important person, I was convinced that I wanted to write about her for real. If you find a great real person, a trailblazer, you want to write about her as nonfiction. At least that is my predilection. I spent hours in archives, looking at microfilm and microfiche, begging archivists for help. (I even wrote about my research problems in an article in The Horn Book, vowing to bribe the gatekeepers with chocolate. I almost resorted to that.) I told everyone I knew in NYC what I was working on. I told strangers at dinner parties. I buttonholed the state archivist and begged her for help. She gave me a great lead to another archivist. Who tried to help.... I pleaded my case to a group of librarians in PA, and that plea led to another great lead--which ended up going nowhere. I had so many leads that went nowhere I felt like a dog-walker walking invisible dogs. But I kept going. And going. And going. I revised and finished a novel during this time. I wrote a picture book. But I kept coming back to my sweetheart. I have an interesting angle you might use in connection with the lack of Harlem Jail records. There's a secret room in the jail holding records from the era that includes MS's undercover work there. It was accessible only by pigeons or by persons who climb a ladder from a room below. The ladder is not a permanent fixture but must be moved into position and held in place by one person while another climbs up, pushes open a panel in the ceiling and climbs into the secret store. It is secret in the sense that unless you knew the room was there, you wouldn't encounter it touring the building on your own. The story goes a caretaker for the abandoned city jail discovered it one day by accident when cleaning the ceiling of the room below. Of course, the pigeons discovered the secret room long before that, flying in through a broken window, and making use of the place as their private toilet. Thus the bundled up records are covered with their dried droppings. The city uses the health hazards presented as the reason for not retrieving the records. In other words, much of Harlem Jail history is held being held hostage by pigeons. But no, this did not stop me. I would not be daunted or deterred by pigeon poop! My husband and I joked about buying Hazmat suits. A friend said she's go with me, too. I actually considered it. I reached out to more and more people, which eventually led to: having dinner with a roomful of retired policewomen; interviewing a 92-year-old policewoman as she lay on her sofa recovering from back surgery (she argued with her friend who brought me there that, no, she would NOT take the clips out of her guns); and, finally, hanging out with a really bright and interesting drug-enforcement officer who, after a dinner in a strange restaurant a few months ago, left me alone in a deserted parking garage late at night while I waited for her to make a phone call inside an unmarked building. When she got back into the car I calmly explained to her how a writer's mind worked, and how she owed me big for the 20 minutes of scenarios that ran through my head during the time she was gone...(all the while texting my husband, saying, "I dont know where I am...!").... It turned out the detective's call was about a fish. A tropical fish. A pufferfish, to be exact. It was very painful, folks. It took me weeks to get over it. Really, it felt like a break-up. I walked around dazed, confused, humiliated, disappointed, angry... but mostly sad. But finally I knew it was time. To find someone new. I might come back. I hope to come back, but for now... I'm moving on. Fortunately, fortunately, while I was travelling last summer, I met someone else. He stood in the corner waiting while I realized my relationship was over. He was respectful. He didn't pounce. He whispered, "Come hither, come hither..."
And now, friends, I have committed. And I am in love. And this one is going to work. This one is Mr. Right. I have written on this subject myself, a rebuttal to the attitude reported in The New York Times, of parents wanting children to leap past picture books to read chapter books in the quest to get them on the road to...what? I have a sixteen-year-old niece, Sarah. A year ago my sister-in-law, her mom, died suddenly. A friend of the family gave my brother a picture book called Tear Soup to help with Sarah’s mourning. She argued – what teen girl wouldn’t? – but grudgingly made room. They cuddled up and read the book. A couple of days later, Sarah asked, “Dad, whatever happened to all my picture books from when I was little?” My brother pulled a box out of storage and the next night came in with Caps for Sale. A new tradition was born. For months, every night, he’d read a picture book to her from her childhood. I have looked up some of the other created holidays for November—International Drum Month, Peanut Butter Lovers Month, Aviation History Month. In my book, this one beats them hands down. In celebration of picture books, I would like to recommend one. I’m cheating, though. This one is not nonfiction, but still, “pure genius” according to its Kirkus starred review. 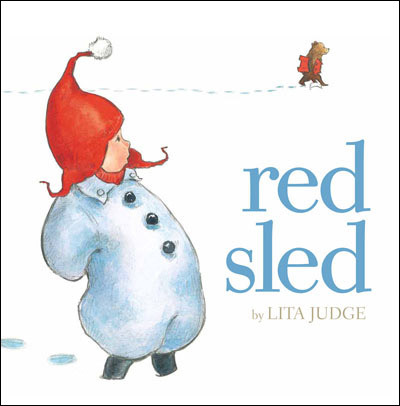 Furthermore it was written by Lita Judge, an author whose books are mostly nonfiction including the lauded One Thousand Tracings and Born to be Giants. Red Sled by Lita Judge is a whimsical dream of fun and magic. And that is a fact! Could It Be My Favorite Book? I'm delighted to introduce author Ann Bausum, our second guest blogger of the week. As someone who was born in Memphis and still has strong family ties to the city, I'm especially fascinated by the topic she tackles in her latest book. The biggest reason I may start calling this my favorite book is the history itself. I literally found myself exclaiming out loud as I worked with facts that leant themselves so well to the dramatic potential of narrative nonfiction. The historical characters, the setting, the chronology, the thickening “plot” would be the envy of any novelist. “Do the history proud,” became my goal. I wanted to give readers the context for the death of Martin Luther King, Jr. Plenty of children (and even adults) don’t know that he died in Memphis. Few people of any age can tell you that he had gone there to advocate for the labor rights of the city’s sanitation workers. Death not only concludes this history; it starts it, too. On February 1, 1968, two sanitation workers were crushed to death while riding inside the barrel of a garbage truck. Within days more than a thousand sanitation and street repair workers decided to strike for the cause of safer working conditions, better compensation, and union recognition. Their demands quickly led to a stalemate between the all-black workforce and the almost entirely white leadership of Memphis. After police attacked peaceful strikers with clubs and tear gas on February 23, the workers rallied behind an expanded campaign for social justice. “I AM A MAN,” became their persistent assertion. The cause of the striking workers overlapped perfectly with King’s own spring objective: to highlight the burden of poverty by mounting a national Poor People’s Campaign. During two research trips to Memphis I studied documents and photos in the archives of the University of Memphis, spoke with eyewitnesses to history, and walked the same routes marched by protestors in 1968. I lingered outside Clayborn Temple, now shuttered but formerly the meeting spot for countless marches. I stood on the stage of Mason Temple, the place where King told audience members how he had gone “to the mountaintop” and “seen the promised land.” I visited the site of his death at the Lorraine Motel, now incorporated into the National Civil Rights Museum, and I observed the perch from which his assassin fired the shot that killed King on April 4, 1968. 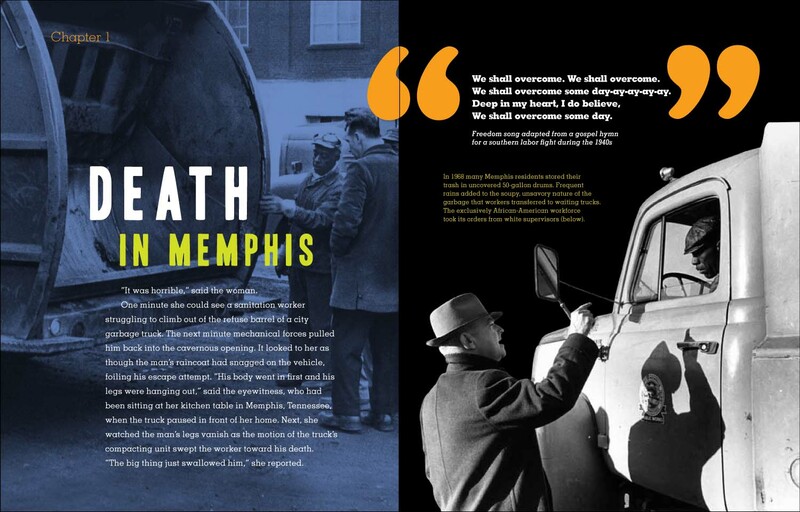 The spotlight on Memphis became so intense following King’s death that the city’s anti-union stance wavered and collapsed. Workers gained their collective bargaining rights, wage increases, and improved worker safety in a strike settlement on April 16. When it came time to start writing, current events created a backdrop that rivaled the power of the Memphis history. I wrote Marching to the Mountaintop from my home in southern Wisconsin at the same time that public employees began demonstrating in nearby Madison. The juxtaposition of the two campaigns for collective bargaining rights became surreal. Immersed in writing about labor rights all day, I emerged to hear each night of fresh labor history in the making. The book’s subsequent production process became equally riveting. 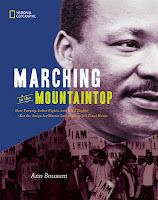 Marty Ittner, a guest blogger on I.N.K, designed Marching to the Mountaintop using the same creative talents that she employed with my 2006 title Freedom Riders and every title I’ve published since—not to mention books by I.N.K. writers Sue Macy and Marfé Ferguson Delano. She transformed dog-eared black and white photos by employing dramatic silhouettes, bold color washes, and retro photo essays. She exploited every possible design element, even the quotation marks. 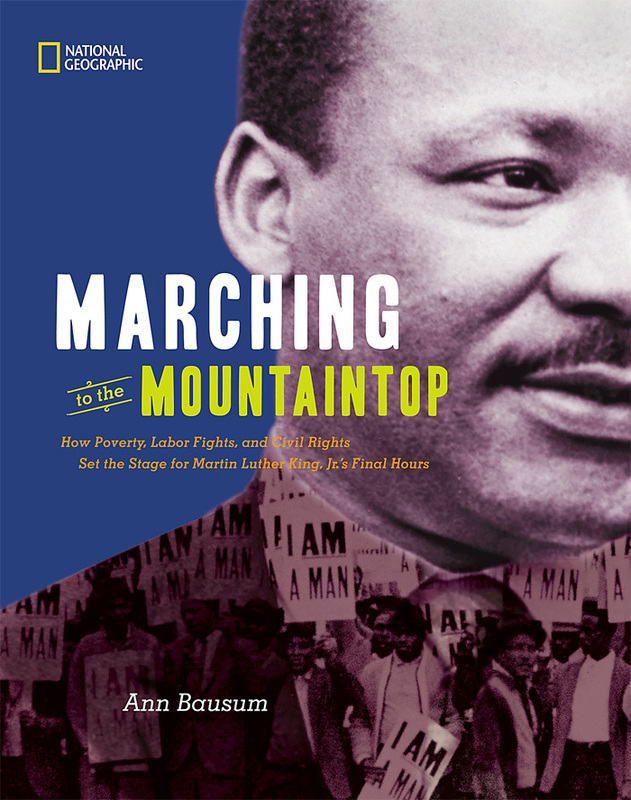 I dedicated Marching to the Mountaintop to my fourth-grade schoolteacher, Mrs. Christine Warren. I had entered her classroom the year integration reached my childhood home in Lexington, Virginia. Although many white parents quietly opted out of having their children placed in classrooms led by African Americans, my parents did not. Thus I became one of the few white students in Mrs. Warren’s class and spent the year celebrating her love of books. King died the next year while I was in fifth grade. A storm raged in Memphis the evening of King’s final speech. (Consider this element one of the many facts which prompted my thanks to history.) He spoke that night of the promised land, a place he could visualize of equality and justice and respect. Where no one would have to declare “I AM A MAN” to be treated like a human being. Where students of all colors learned from teachers of every color. “I may not get there with you,” King said that stormy evening. “But I want you to know tonight, that we, as a people, will get to the promised land." Will the Real Maria Anna Mozart Please Stand Up? It's my pleasure today to share a guest blog post by friend and fellow critique-group member, Elizabeth Rusch. Soon after my newest nonfiction title for young readers, For the Love of Music: The Remarkable Story of Maria Anna Mozart (Tricycle Press/Random House, 2011) was released, I began getting emails from friends telling me about a French film on the same subject called Mozart’s Sister. The film finally came to Portland, and I was invited to do a Q&A after the show on opening weekend. Thank goodness, because whether I was invited to or not, I would have wanted to stand up in front of the audience and set the record straight. What Is Accurate: The Mozart family did indeed tour Europe for three years, traveling by carriage for more than 3,000 miles, giving concerts in 88 cities. Maria Anna, older sister of Wolfgang by five years, was a child prodigy, a gifted virtuosic pianist. She composed music, and indeed, her music has been lost. What I Loved: The depiction of the Mozart family relationships, their affection, dedication to music, and the silliness that bordered on bawdiness (especially when Leopold and the two children stand at the bathroom door while the mother tries out the bidet) captured visually what I read in the Mozart family letters. There were other gorgeous moments in the movie that probably came from primary source material. Maria Anna writes in her journal from the European trip about watching the waves come in and out at Calais. And there it was, the beautiful Marie Féret, hair fluttering in the wind, staring dreamily at the ocean. Wolfgang loved canaries, and there he was poking one with a violin bow. What Is Inaccurate, Misleading, and Troubling: Soon after establishing the Mozart family on their journey, a carriage wheel breaks outside Paris. Broken carriage parts are mentioned frequently in the family letters, but here the movie jumps off a solid foundation based in fact to a completely fictional account that is not only inaccurate, but also blatantly contradicts what we know about the Mozart family and their daughter. In the movie, Maria Anna develops close friendships with a daughter of Louis XV and the crown prince. The second relationship is struck while Maria Anna cross-dresses to deliver a letter, and plays violin and sings for the prince. Maria Anna begs to stay in Paris while her family continues on the musical tour. When they leave, she continues her relationship with the prince, studies composition at a Paris academy dressed as a boy, and writes a violin concerto. The critique: Oh, where to start! Maria Anna was closely chaperoned by her parents at all times, did not stay in Paris alone as a young, single 15 year old, developed no relationship or romance with French royalty, didn’t cross dress, or even play violin! While there are references in letters to Maria Anna singing, they usually entail Wolfgang teasing her about her singing voice. Maria Anna’s singing was not her genius, her harpsichord playing was. The movie depicts Maria Anna burning her violin concerto and claims that she never composed again, had only one child, and that she died blind and poor. Yet later letters from Wolfgang praise Maria Anna for her compositions, she eventually married a baron enabling her a comfortable living, and she had three children, only one of whom died in childhood. The Story the Movie Missed: In the end, Mozart’s Sister seems more obsessed by the weird court of Louis XV than in its title subject matter. So much rich, dramatic material about Maria Anna Mozart’s life was distorted, misrepresented or ignored. Here’s what I find amazing about Maria Anna’s story: She was a child prodigy, thought to be a better pianist than Wolfgang – and all the other pianists in Europe. She was Wolfgang Mozart’s closest musical collaborator, and, as I explore in a recent Smithsonian magazine article, was probably an important musical influence. There’s an incredible scene from Maria’s life that the movie skips completely. While in London, Leopold falls ill and the children have to be very quiet – they can’t even play their instruments. So together, Wolfgang and Maria Anna write what is known as Wolfgang’s first symphony. But it is in Maria Anna’s handwriting. After the three-year musical tour, the family returns to Salzburg. But when Wolfgang sets off to tour Europe with his father and later with his mother, Maria is left home. While he learns composition and is exposed to the stimulating musical life of Italy, Maria oversees the cook, gathers herbs, and mends clothes. But she also continues to practice for hours each day, teaching herself harmony, modulation, interpretation -- and composition. She falls in love, and she and Wolfgang share a dream of the family reuniting in Vienna, where she would be married to her love, teaching music and giving concerts. Sixteen months later, Maria Anna is married off to a baron who is twice widowed and already has five children. But she continues to play three to four hours every day – even when her instrument goes horribly out of tune and can’t be fixed for more than two years. When her husband dies, Maria Anna returns to Salzburg where she teaches music and gives private concerts. At the age of seventy-eight, Maria died. Two weeks before she died, though she was blind and has lost the use of one hand, she asked to be carried to the piano that she and Wolfgang play on together as children. Found on the piano were scores from her brother’s operas Don Giovanni and The Magic Flute, probably the last music she ever played. On their childhood tour, Wolfgang often played blind to astonish audiences. At the end of her life, his sister Maria Anna also played blind, and with only one hand, for the sheer love of the music. What bothers me most about Mozart’s Sister is that the film used Maria Anna to get to the Louis XV court and then ignored her and who she really was. I’ve been thinking a lot about habitats lately. One of my favorite hiking spots features two very different habitats—a woodland and a pond—and each one has provided a special experience that eventually led to a book. So today I’m going to share a video about that very special place and a list of some of my favorite children’s book about habitats. Like all of Jenkins’s books, this one offers a combination of glorious cut paper collages and clear, concise text. It also has a fun, interactive game-like quality that invites participation. 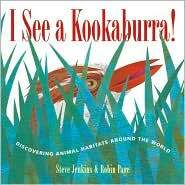 I See a Kookaburra introduces children to six of the world’s habitats and some of the animals that live in them. As an added challenge, and to make the point that ants live all over the world, one of these insects is hidden in each scene. Rich backmatter with maps rounds out the presentation. School Library Journal calls the book “A first-rate foray into ecology that will encourage readers to explore the world around them,” and I couldn’t agree more. Some habitats are huge—a savanna, a forest, an ocean, but this book celebrates the wonders of a hidden microhabitat—a hole in a tree. As a bear sharpens her claws on a tree trunk, she unknowingly begins a chain of natural events that, over time, form a tree hole home for a menagerie of forest creatures, from salamanders and tree frogs to a family of white-footed mice. Lyrical prose and highly detailed, realistic illustrations bring the world beneath the bark to life for young readers. 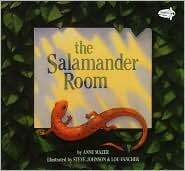 The Salamander Room is a gentle tale with an important message. A boy finds a salamander in the woods and asks his mom if he can keep it. Instead of saying “no,” she asks him questions that encourage him to think about what the salamander needs to survive and, ultimately, to realize on his own that he cannot create an adequate home for the salamander in his bedroom. Lush, shadowy paintings perfectly capture the mood of the boy’s increasingly elaborate plans for transforming his room into a suitable habitat for the little amphibian. 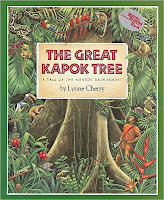 Clear, straightforward text provides wonderfully detailed information about redwoods and the microhabitats they support. But the art offers more—pure magic. 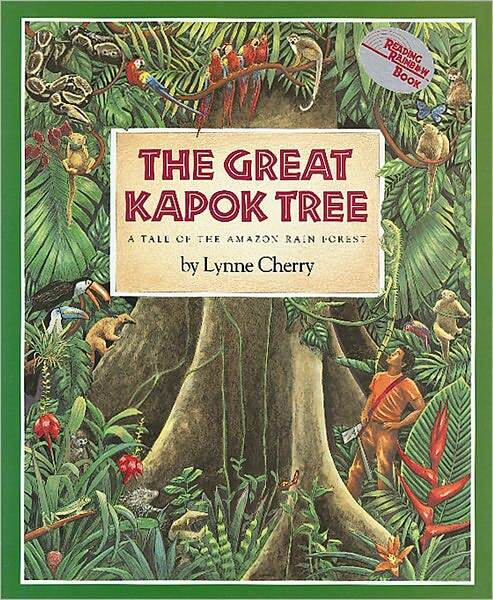 It gives readers a peek into the imagination of a boy reading a book about towering redwood trees. The journey begins in a New York City subway car, but transports the boy—and the readers—into a redwood forest where climbing gear appears at just the right moment, allowing readers to scale a giant tree and take a look around. It’s not often that a picture book shares fascinating science content and simultaneously promotes curiosity and fosters imagination, but this book does it all. In this breathtakingly beautiful picture book, a man falls asleep while chopping down a kapok tree in a Brazilian rainforest. As he naps, a variety of forest creatures and finally a child whisper in his ear, explaining why the trees and the forest is so important. When the man awakens, he gets up and goes home without completing his task. Thus, the book shows readers the lushness and beauty of the forest habitat and explains its importance in a way that will resonate strongly with children. Rich, vivid endpapers include a map of the world's tropical forests and the amazing array of Amazon wildlife. This collection, illustrated with striking woodcuts, features science facts combine with vivid poems about pond life through the seasons. 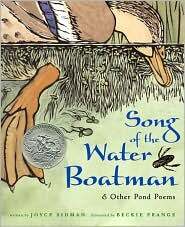 Focusing on one pond creature or plant per spread, Sidman employs a variety of age-appropriate poetic forms to bring the habitat and its inhabitants to life for readers. The poems will certainly engage children, and the rich prose sidebars are chockful of background information sprinkled with fascinating tidbits. After reading this elegant, inspiring title, children will be begging for a field trip to the nearest pond, so they can see nature’s wonders for themselves. 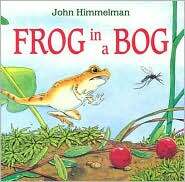 Frog in a Bog—John HimmelannThis cleverly conceived circular story begins with a frog jumping off a fern and ends with a frog (presumably the same little critter) jumping back onto a fern. In between, readers follow a chain of events that introduces young readers to wetland inhabitants and clearly explains their interdependence. Accurate, detailed watercolors show the bog and its residents in their true glory, and field guide-like backmater will encourage young explorers to observe and identify at the animals living in nearby wetlands. 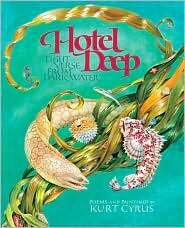 Engaging poetic text and lavish, detailed paintings plunge readers into the amazing world below the ocean’s wavy surface. As we follow a lost sardine searching for its companions, we are treated to one glorious underwater scene after another. Some creatures hide and others hunt, simultaneously introducing readers to predator-prey relationships and adding a sense of drama to the book. A thumbnail picture-glossary identifies about two-dozen ocean creatures. This is a great read-aloud title and a perfect choice for introducing a unit on the ocean. Coral reefs are one of the ocean’s most critical habitats, so it’s great to see a book that gets down to the bottom of it all, describing the lifecycle and behaviors of coral animals in detail. Brickman’s colorful three-dimensional artwork add wonderful textured layers to the coral-reef scenes. 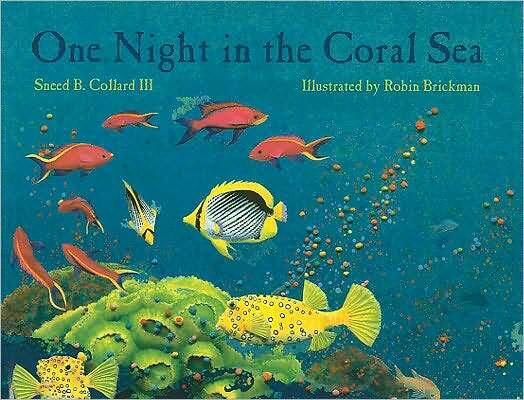 Try pairing this book with Colorful Captivating Coral Reefs by Dorothy Hinshaw Patent for even more amazing information about the cast of characters that call coral reefs home. 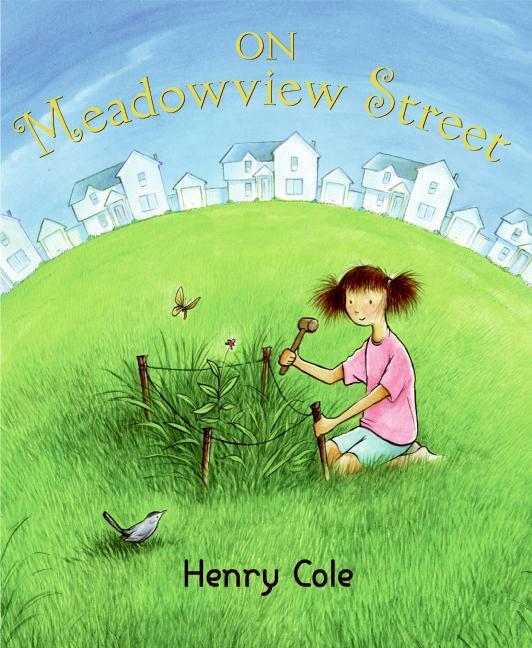 In this wonderful story, author-illustrator Henry Cole introduces us to curious, clever Caroline, a young girl who’s destined to become a scientist. 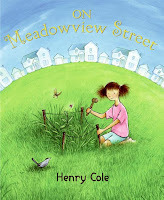 Caroline wonders why her new home is on Meadowview Street, when there isn’t a meadow in sight. So when she spots a lone wildflower in her lawn, she asks her dad to mow around it and he does. Soon, her one-flower nature preserve has expanded to include the entire back yard. Then following Caroline’s lead, neighbors transform their yards too. Cole’s spare text and tender, acrylic paintings team up to tell the lovely story blooming with simplicity and energy. Do you have your own favorite habitat book?